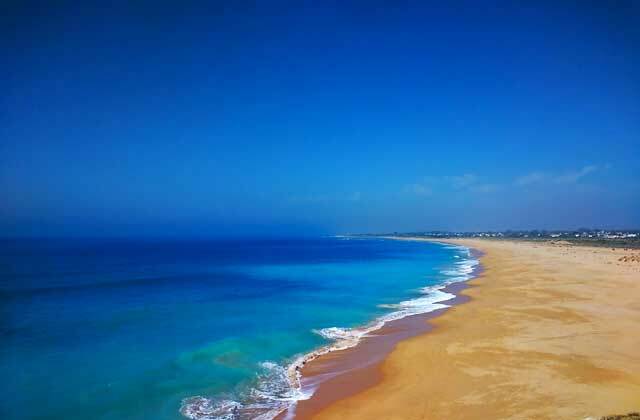 There are some places that just can’t be found anywhere else in the world and Caños de Meca, in Barbate is one of them. This hamlet is located in the South of Andalucia, along the Cadiz coastline and became a focal point for the hippie and bohemian movement of the 1960s. Today, it remains a haven for those in search of ‘karma’, the tranquillity of endless beaches, crystal clear waters, nudist enclaves, all set in the Breña Natural Park, offering vegetation consisting mostly of pinyon pines falling growing just beside the sea. Caños de Meca is just a small street of low houses situated on top of a cliff, but during the summer months, it becomes the ‘mecca’ of hippies, surfers, bohemians, nudists, naturists and increasingly family tourists. 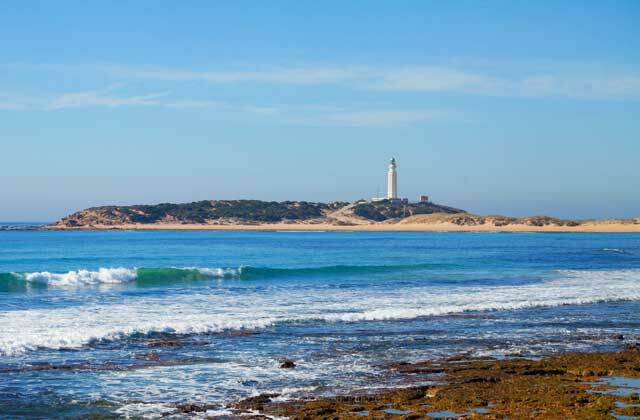 It draws its name for the large number of pipes or jets emerging from the freshwater cliffs, with the greatest number of these located at the end of a beach known as “Little Lulu”. Although it is difficult to access, it is worth the effort to visit. And, of course, visitors come in search of the ‘miraculous’ mud that bathers can extract directly from the rock beach, smearing it across their body, leaving their skin soft and smooth. 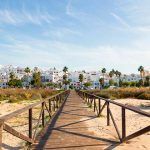 For this this and more, we at the Fuerte Blog made a trip to Barbate and Caños de Meca from our base camp in Conil de la Frontera, just a 15 minute drive away, to share with you everything this area has to offer. Consider this a “must visit” destination that you cannot miss out on. We started with the market because, as we all know, when travelling, the first thing to try is its cuisine. Here’s our proposal for purchases that are healthy, native, sustainable and OKM in the Abastos de Barbate market. It is in a region’s market that one can really get to know a place – a place full of life, full of men and women doing their shopping, fresh produce, all in shops full of life with a ceaseless bustle of artisans selling exquisite products at an affordable price. Our tour begins at the charming little shop of Especias Elvira Olive. It’s there where we’re received by Gertru, whose family has run the store for 40 years. 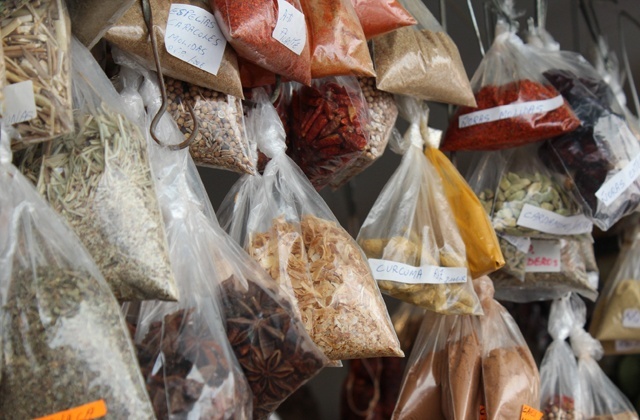 This explains why this charming resident of Cadiz knows every detail of the spices sold there. 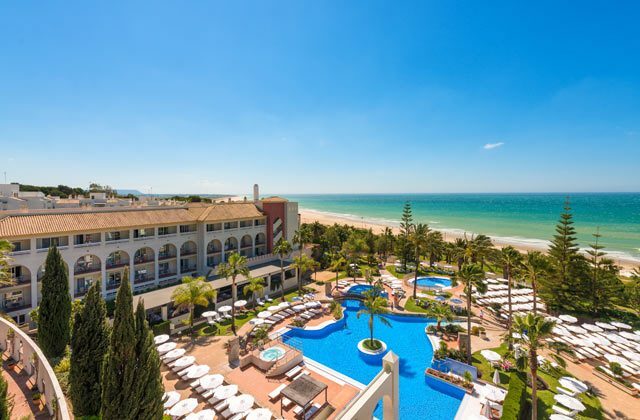 With the view of Morocco clear across the Cadiz coastline, one can enjoy fine dining. Gertru explains how to prepare a cous cous, which she sells as well – a dish brought from the country that we can see from the beach. Turmeric, cinnamon, bay leaves, cloves, pepper and many spices all come together to provide healthy additions to the digestive and diuretic systems, while anise and saffron help to ease tension. All these ingredients come together in an artistic mix to create a superb taste in your mouth. In addition to the dish, Gertru offers homemade honey, marinated olives prepared a thousand different ways with an artistic touch that cannot be sold, but has come to be a characteristic part of this special land. Artisan handicrafts that provide healthy guarantees. Along our route to the market, we found a shop of breads and sweets called El Puente. Despite the competition they have, these masters of baking rise each morning at dawn to offer their customers the best of their traditionally produced delicacies. Baguettes and smaller loaves are handmade with no additives or preservatives, offering a special flavour that only a personal touch can offer. We were also able to sample a loaf made with a dough made of seeds, without flour or wheat. 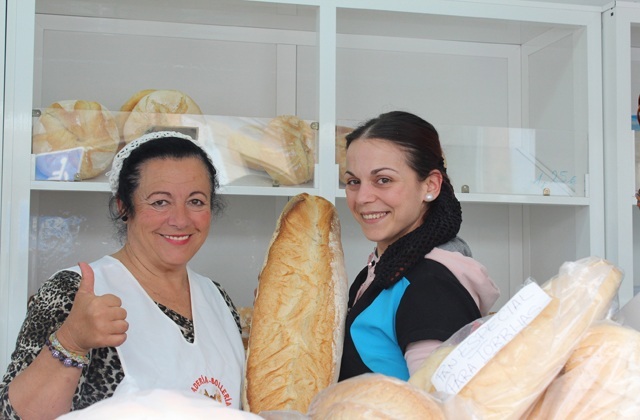 Besides knowing the ins and out of artisanal baking, ‘Maria, the Baker’, as she is known around Barbate, told us how difficult it can be to compete with supermarkets on the basis of price when making a product that is completely handmade, as she has done her whole life, without any additives. Exuding sympathy and good humour, Maria explains that one day, artisans will come to dominate the market. However, more than sympathy, Maria exudes kindness and did not hesitate a second to offer us a delicious muffin with olive oil – a true delicacy. 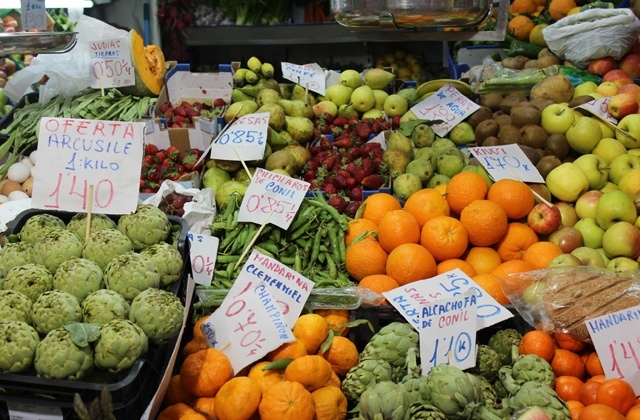 When entering the market, the wealth and variety of colour of vegetables is obvious and immediate: watermelons, bunches of carrots, apples, onions, oranges… everywhere. Now that Easter is arriving, it’s more common to purchase typical, local vegetables and products. This is due to the tradition of not eating meat on days of the Passion and instead, chícharos (peas) (or guisantes as they are known in this part of Andalucia), beans and artichokes, which all become central to the Andalucian menu. Specifically, the artichokes are an the most indigenous product of Conil and its area of influence. Much like traditional artichokes, these local products offer a more pronounced taste and flavour. Fernando Lopez, who is in charge of the grocery store, presented us with some roasted sweet potatoes, another typical Easter product. Here, we were also treated with a nice chat with both workers and local customers, who immediately rushed to recommend seasonal items, cultivated in San Lucar, Conil and Barbate. They may not have known exactly what KM0 products meant, but it was clear that those fruits and vegetables sold in Barbate are raised and eaten in the area. In a coastal town with a fishing tradition, one cannot ignore a stop for some fish. The largest tuna in the region are caught here in Barbate and the fish has emerged as a flagship product, especially during the Spring. 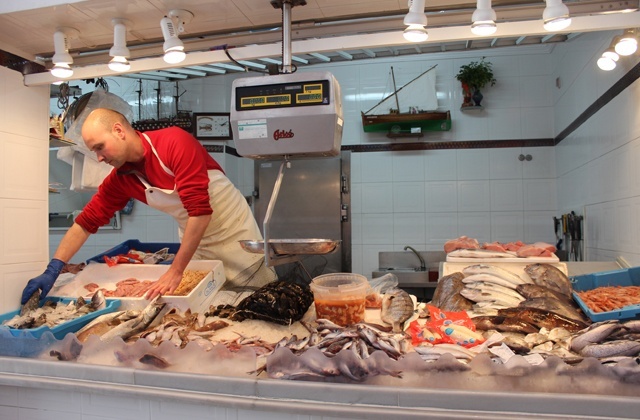 The stand of Jesus Valdes provides all types of seafood snacks, fresh from the Atlantic. On our trip to the market in Barbate, we were able to sample the shrimp, prepared locally by grilling it with garlic and parsley. Seafood and fish – all the finest quality within reach. To make the most of your visit, we recommend sampling the freshest from the sea: cuttlefish, clams, mussels and fresh tuna prepared a thousand different ways. Don’t hesitate to ask for local advice on how best to prepare recipes, because they will be more than happy to share their secrets about how to prepare a fine, seafood meal. 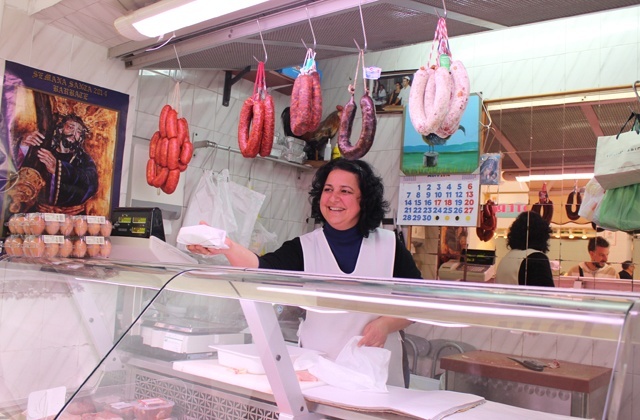 Another stop not to miss in the Barbate market is the butcher. It seems that just about everything in this market is homemade. The Fernández Vargas family butcher calls its customers’ attention with a sign for “homemade hamburgers with local vegetables”. Fresh meat is carefully chosen for their customers and given a distinct twist of flavour and colour. Milagros, the daughter of the family, served us and explained that the business has been run by the family for years and jobs are passed on from parents to children. If you can take away anything from this visit to the market, it is the wealth of affection and familiarity shown between shopkeepers, friend, acquaintances and even strangers. Residents from across the town come to do their shopping because when they do, they are guaranteed a fresh, healthy and pleasant experience for their palate. 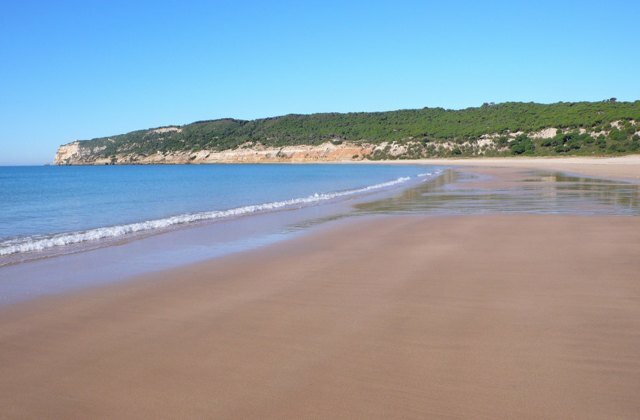 As we have mentioned before, Caños de Meca is known for its beaches of fine white sand and crystal clear waters, which have won the hearts of millions of tourists. 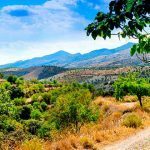 People from all parts of the country and abroad have come to this small corner of Spain, drawn by just a pair of narrow streets full of a naturist environment, inviting the most attention during the summer months. Once a meeting place for hippies and bohemians, this place now takes us on a journey back in time to the 1960s. 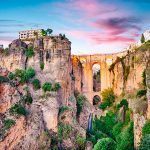 Many of the travellers that arrived in Caños de Meca still reside there, running bars, restaurants or simply bought a house to live throughout the year, far away from maddening crowds. One of the highlights of this getaway is undoubtedly the area’s coast. 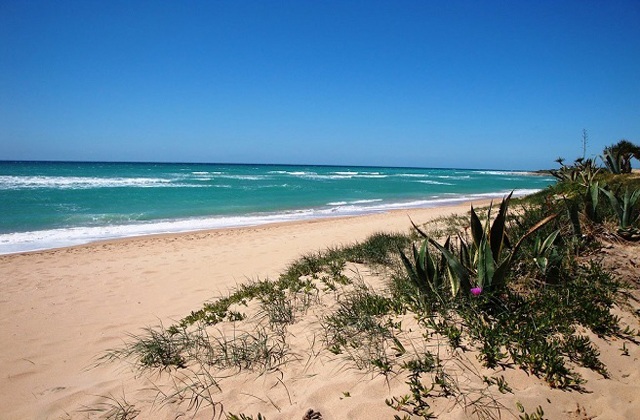 Sandy beaches and dunes stretch along the coastline, dotted with reefs and protection beneath the rocks. On a pleasant stroll through the area, one can see the famous “caños” or pipes of freshwater that give the place its name. This area has proved inviting for nudists. 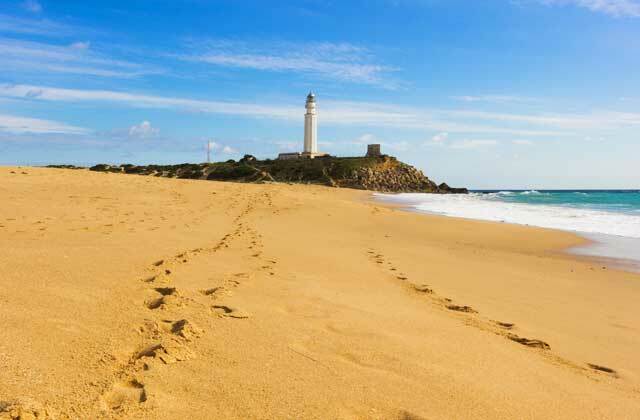 Caños de Meca has a stretch of beaches that include areas that allow visitors to remove any and all clothing. It provides an experience of freedom at its best, as well as the opportunity to feel the direct contact of the sun and water on your skin. A sand spit formed by a moving dune, jutting into the sea, this point is home to the Trafalgar Lighthouse, as well as a notable historical event – the Battle of Trafalgar. In fact, these cliffs are living witnesses to the battle and those fallen on both sides. 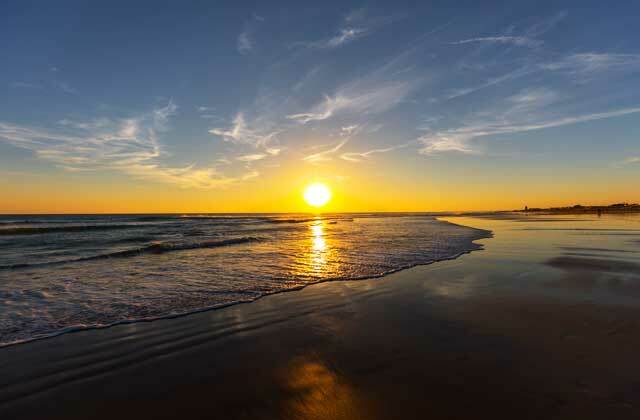 Don’t miss out on the chance to catch a sunset at El Palmar beach, where visitors have been known to literally applaud for one of the most beautiful sunsets in Andalucia. If you are headed to Caños de Meca, be prepared to oxygenate your skin. On the rocky walls that form the coast, one can find a natural clay loaded with vitamins and minerals. This pure product of marine life will help soften one’s skin and body. The treatment is very simple. One need only take a piece of clay and get it wet in the sea water. After gradually softening it, you will knead it until you get a creamy texture. It is then that you can apply it to your body. Once complete, you can head to the sun and wait for it to dry, which should take about 40 minutes to get the full effect. After that, you can take it off with seawater and you’ll immediately notice how extremely smooth it leaves your skin. There is no better treatment than a natural one. Although our journey then came to an end, this area offers enough potential to keep us talking for dozens and dozens of hours, but we’ll let you continue discovering on your own. Enjoy Caños de Meca! 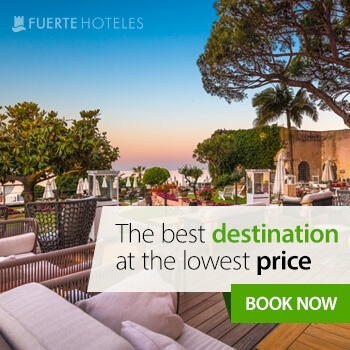 If you are looking for accommodation in the area, we recommend the Hotel Fuerte Conil-Costa Luz, facing one of the most beautiful beaches in Spain – the La Fontanilla beach. 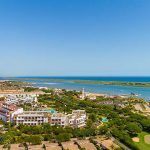 Just 5 minutes walk from the centre of Conil de la Frontera, this hotel inspires tranquillity, security and confidence with rooms with superb sea views, spacious common areas and an exquisite local menu.